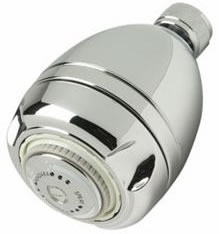 The 1.5 gallons per minute (GPM) adjustable spray of this showerhead delivers a broad, rain-like spray or a focused, 9 jet turbo massaging spray. It is self-cleaning and the non-aerated spray means less water temperature loss. Water flow is consistent regardless of the water pressure. Features a high-impact ABS thermoplastic body with a chrome finish, a chrome-plated brass collar and standard 1/2" inside threads.